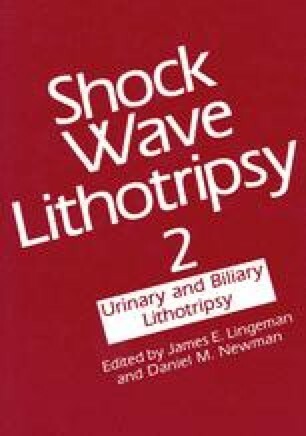 In this study shock wave lithotripsy was investigated as a tool to measure the relative strength of calcium oxalate aggregates. The technique of image analysis was studied for its ability to quantify the degree of calcium oxalate aggregation. Calcium oxalate monohydrate (COM) and calcium oxalate dihydrate (COD) crystals with known morphology were synthesized from supersaturated solutions at 21°C. The COM was conditioned in suspension with bovine serum albumin (BSA) and chondroitin sulfate (CS) at concentrations of 0.1, 0.5, 1.0, and 5.0 ppm. Ten cc aliquots of the suspensions were exposed to either 250 shock waves (SW) or 500 SW from the lithotripter (Technomed Sonolith 2000). Shock wave lithotripsy was found to be useful as a relative measure of aggregate strength of calcium oxalate aggregates and that image analysis was satisfactory as a measure of aggregate size distribution. Preliminary data suggest that in the absence of flocculant (albumin or CS), COD forms stronger aggregates than COM. In addition the data suggest that there is a critical flocculation concentration for albumin and chondroitin sulfate.